MT: I’ve been writing stories for as long as I can remember. My ambitions have changed a lot throughout my life, but I remember saying as early as grade three that I wanted to be a writer. I finished my first novel when I was about nine or ten. It was a very bad, very shameless rip-off of J.R.R. Tolkien and George Lucas. MT: I’m still figuring that out. When I’m working on a novel, I prefer to write at least 1000 words a day, depending on my day job’s busyness. These days, I usually write for about an hour in the evenings. If I could stay home in the mornings, I would prefer writing before noon; but since I work weekdays, post-dinner sessions will do for now. I take weekends off. CHHR: Do you have any interesting writing quirks? If so, what are they? MT: I wish I could honestly say “yes,” that I like to flay myself while blaring recordings of Gregorian chants, or that I drink Sunny D from the mouth of a human skull between paragraphs or something. But the truth is that nothing exciting comes to mind—I usually play music on my headphones (something really heavy or really soft, depending on the project), sit at my desk and tap away on my laptop. MT: I enjoy both processes for different reasons. As an adult, I’ve only completed one full-length novel, and I found the editing process extremely long and laborious. For my next novel, I think I’ll go in with a clearer sense of direction from the outset. When it comes to short fiction, there’s less risk in my usual M.O., which is generally to improvise and follow my instincts and then go about the more surgical re-structuring after the first draft is complete. MT: In terms of horror writers who live in Calgary, I can think of a couple off the top of my head: Sarah L. Johnson, who wrote Suicide Stitch and a story in Unnerving’s recent Hardened Hearts anthology, and Craig DiLouie (I think he still lives here, anyway). I really love the Night Terrors Film Society, which is a small group that runs local horror film screenings. MT: I always go in with some sense of direction, but I’ve never outlined anything. For me, it feels natural to go with the flow, but I think that will change when I start writing my next novel. MT: Creepy Campfires (for Grownups) was my first paid publication—they bought a story called “Long Man.” That piece had a much different structure and focus in its initial form, as an excerpt of an abandoned larger project. When I first wrote the piece, the title creature was a kind of foil for the narrator, a ghost undergoing a murder investigation. The anthology’s editor took a strong interest in the Long Man character, and wanted me to write something that more clearly depicted his backstory. So, in a very direct way, my first story publication encouraged me to rethink my process. MT: My favorite horror stories usually seem to have a sense of real respect for the genre. Otherwise, I would say a good horror story requires the same ingredients as any good story—distinct voice, sincerity, intelligence and an author’s personal perspective. MT: I’m doing early research for a novel, and I’m about midway through a new short story that seems suspiciously non-genre to me. MT: Too many books to name! I’m currently reading Stephen King’s Just After Sunset and René Descartes’ Meditations on First Philosophy. In terms of horror fiction, some of the titles I would like to get to this year are Kristi DeMeester’s Everything That’s Underneath, Tananarive Due’s My Soul to Keep, Gwendolyn Kiste’s Pretty Marys All in a Row, Tiffany Scandal’s There’s No Happy Ending, S.P. Miskowski’s Knock Knock, John C. Foster’s Dead Men and Paul Michael Anderson’s Bones Are Made to be Broken… but the list is endless, honestly. I want to read everything! There are so many wonderful books being published in the horror genre alone, but I like to read a wide variety of fiction and nonfiction. MT: Last year I read Jeffrey S. Victor’s Satanic Panic, which was a pretty disturbing social-psychological study of rumor panics. It’s all about the systematic exploitation of ignorance and fear, which we can currently see playing out in contemporary political contexts (consider the election of a fearmongering idiot like Donald Trump as one obvious example). MT: I’ve always loved rabbits, but I wouldn’t call them my spirit animal because the term has such a culturally specific meaning. MT: As long as it’s dark and/or hoppy, I’m usually happy, but I don’t drink very often. MT: I think James Joyce would make great beer-drinking company. Mike Thorn resides in Canada. 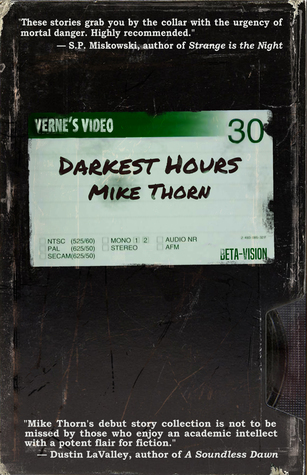 Mike is the author of the short story collection Darkest Hours. 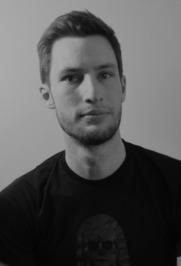 His fiction has appeared in a number of magazines and anthologies, including Dark Moon Digest, Behind the Mask – Tales from the Id and Straylight Literary Arts Magazine. 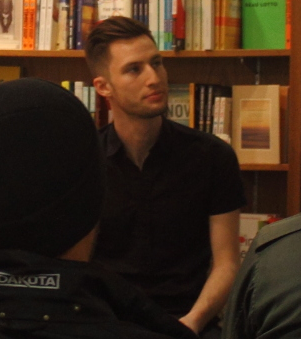 His criticism has been featured recently in MUBI Notebook and The Film Stage, and he co-authors the horror-themed series “Devious Dialogues” with A.M. Stanley for Vague Visages.